A diving mask (also half mask, dive mask or scuba mask) is an item of diving equipment that allows underwater divers, including, scuba divers, free-divers, and snorkelers to see clearly underwater. Surface supplied divers usually use a full face mask or diving helmet, but in some systems the half mask may be used. When the human eye is in direct contact with water as opposed to air, its normal environment, light entering the eye is refracted by a different angle and the eye is unable to focus the light. By providing an air space in front of the eyes, light enters normally and the eye is able to focus correctly. There are two basic categories of diving mask: The half mask covers the eyes and nose, and the full face mask covers eyes, nose and mouth, and therefore includes a part of the breathing apparatus. The half mask is described here. The elastomer skirt provides a seal between the lenses and the diver's face. The material may be almost transparent, translucent or opaque. A nearly transparent skirt provides a greater peripheral vision, though somewhat distorted, and may reduce the feeling of claustrophobia in some divers, but in some cases the light entering through the sides may cause distracting internal reflections. The skirt also encloses the nose, usually by means of a nose pocket, so that air can be exhaled into the mask to equalise the pressure during descent. A rigid frame may be used to connect the lens(es) to the skirt, or they may be permanently bonded together without using a frame. Masks that are used at depth must be constructed so that the diver can exhale through the nose into the mask to prevent the "squeeze" caused by increasing pressure during descent in water. The nose section of the mask also needs to be flexible to allow the diver to block the nostrils to perform a maneuver such as the valsalva maneuver or the frenzel maneuver when equalising pressure in the middle ear. Some masks have a one-way purge valve under the nose to let water out. While common in snorkeling, this feature is less favored by scuba divers because of the possibility of the valve failing at depth and leaving the user with a leaking mask. Sometimes masks are sold in conjunction with snorkels and/or swimfins. 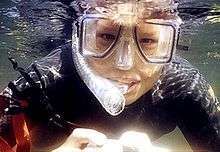 Low quality snorkelling masks may have a low-quality plastic or glass faceplate, and are not recommended for anything but rare, casual use. Masks that have the snorkel built in are considered hazardous as well. Refraction of light entering the mask makes objects appear about 34% bigger and 25% nearer when underwater. As the diver descends in clean water, the water acts as a colour filter eliminating the red end of the visible spectrum of the sunlight entering the water leaving only the blue end of the spectrum. Depending on the depth and clarity of the water, eventually all sunlight is blocked and the diver has to rely on artificial light sources to see underwater. A variety of prescription lenses can be fitted inside the glass plate of the mask to correct some visual problems underwater. Divers may be able to use contact lenses inside the mask but they may need to keep their eyes closed if they remove the mask underwater to avoid losing the lenses. Double-dome masks restore natural sized underwater vision and field of view, while also correcting for a certain range of myopic vision. To prevent a mask from fogging up due to condensation on the glass plate many divers spit into the dry mask before use, spread the saliva around the inside of the plate and rinse it out with a little water. The saliva residue allows condensation to wet the glass and form a continuous film, rather than form droplets. There are commercial products that can be used as an alternative to the saliva method, some of which are more effective and last longer. 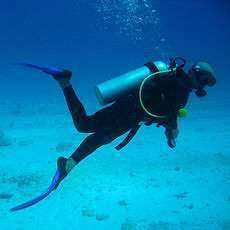 Equalizing of the mask is an essential skill for any form of diving. Goggles that do not cover the nose can not be equalised and are unsuitable for diving. The mask is equalised by exhaling sufficient air through the nose to provide a balanced internal pressure. Any excess will simply leak out around the skirt. Equalising (or clearing) the ears is necessary to prevent barotrauma to the middle and inner ear. 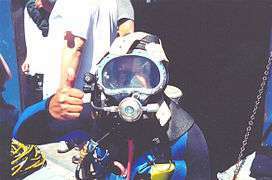 Some divers need to pinch the nostrils closed as part of their equalisation technique, and this must be allowed for in the design of the mask skirt. A twin-lens, low-volume diving mask, Aqua Lung (Technisub) Sphera, with wide peripheral view of the type favoured by many Underwater Hockey players. A further development is the mask with two windows, one for each eye. It can have the windows closer to the face than the one-window type, and therefore contain even less internal volume for the diver to clear or equalise. These types are often called a "low-volume mask". Participants in the sport of underwater hockey are required to use twin-lens masks of this type for their own safety - the sport uses a heavy lead puck similar to an ice hockey puck, nan but skilful players can flick the puck considerable height off the bottom when making passes which leads to the possibility of accidental puck contact with other players. Should a puck hit the lens of a single-lens mask there is a good chance it will break the glass and pass through the aperture to hit the face and eyes, but with a twin-lens mask though the glass may break the frame will prevent the passage of the puck any further. The double-dome mask. This was invented by HydroOptix. Double-dome masks allow a wider field of view and avoid the refraction error in perceived distance and size of objects. Underwater the curved mask windows make the diver's vision effectively more hyperopic, or less myopic, and the diver must wear special contact lenses to compensate (unless his eyes are myopic to the right amount to compensate exactly for the refraction at the curved mask windows). The diver's vision will become myopic when he puts his head out of water with the contact lenses in. The "Data Mask", developed by Oceanic, is a half mask with a built-in LCD head up display which displays various dive and breathing set conditions including the function of a diving computer. It is currently very expensive. full face diving mask - often worn by working divers who need underwater verbal communication ability. Lightweight diving helmet - usually worn by divers using surface supplied diving equipment. Copper hat - part of the old fashioned standard diving dress. fluid filled mask - the need to equilibrate the internal pressure in the mask by exhaling air through the nose reduces the freediver capacity to dive deep. Masks or swimming goggles with high power lenses (40-200 diopters) have been developed in this view: they are filled with water or saline fluid. 1 2 3 Professional Association of Diving Instructors (2008). Encyclopedia of Recreational Diving (3rd ed.). Rancho Santa Margarita, CA: PADI. ISBN 1-878663-01-1. ↑ Butler, FK; Gurney, N (2001). "Orbital hemorrhage following face-mask barotrauma". Undersea and Hyperbaric Medicine. Undersea and Hyperbaric Medical Society. 28 (1): 31–4. PMID 11732882. Retrieved 2008-07-06. ↑ Adolfson J and Berhage, T (1974). Perception and Performance Under Water. John Wiley & Sons. ISBN 0-471-00900-8. ↑ Bennett QM (June 2008). "New thoughts on the correction of presbyopia for divers". Diving Hyperb Med. 38 (2): 163–4. PMID 22692711. Retrieved 2013-04-19. ↑ "Discover What You Have Been Missing!". HydroOptix. 30 April 2009. Retrieved 2009-09-23. ↑ "DataMask HUD". Oceanic Worldwide. 2007. Retrieved 2009-09-23. ↑ "Fluid Goggles". Liquivision Products. 2009. Retrieved 2009-09-23. Alexander, JE (1977). "Allergic reactions to mask skirts, regulator mouthpieces, and snorkel mouthpieces.". South Pacific Underwater Medicine Society Journal. 7 (2). ISSN 0813-1988. OCLC 16986801. Retrieved 2008-07-06. Chou, Brian; Legerton, Jerome A; Schwiegerling, Jim (2007). "Improving Underwater Vision: Contact lenses and other options can help patients safely maximize their vision underwater.". Contact Lens Spectrum (June). Retrieved 2009-06-27. Olsson, DJ; Grant, WD; Glick, JM (2008). "Conjunctivitis outbreak among divers". Undersea and Hyperbaric Medicine. Undersea and Hyperbaric Medical Society. 35 (3): 169–74. PMID 18619112. Retrieved 2009-08-07. Deep Ocean Diving's Ocean Science – Explanation of the physics of underwater vision.